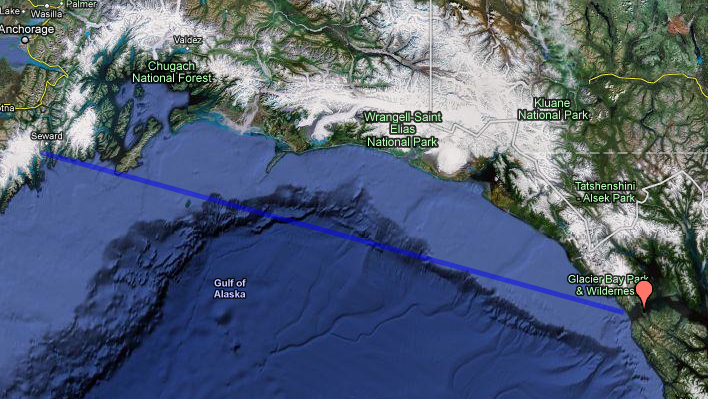 Leg 1 of our Big Trip was to take Wings across the Gulf of Alaska, from Seward to Elfin Cove. See the image below. We completed the crossing in August, 2010. As the rhumb line distance is about 420 nm, the trip required four days to complete. We motored the entire way since there was little wind, or little usable wind. Motoring got us across the Gulf faster. That's the North Pacific out there! We decided to stay a bit closer to shore on the crossing that we had originally planned. Allstate, our insurer, specifies that we could not be more than 100 nautical miles offshore. Additionally, we could more easily have gotten to a harbor if things had gone wrong or weather become unmanageable. Once in Elfin Cove, we took our time exploring the Inside Passage, and continued to do so as far south as Petersburg. We put Wings to bed for the winter of 2010 in lovely Petersburg. Leg 2 began when we flew to Petersburg in late April, 2011, performed some maintenance (replacing leaking fuel line, installing electronics, and such) then headed south again. By mid-summer 2011, we planned to be in the San Francisco Bay area.